Curb appeal can help increase overall home value but no one wants to sink a lot of money into a home they are intending to sell. 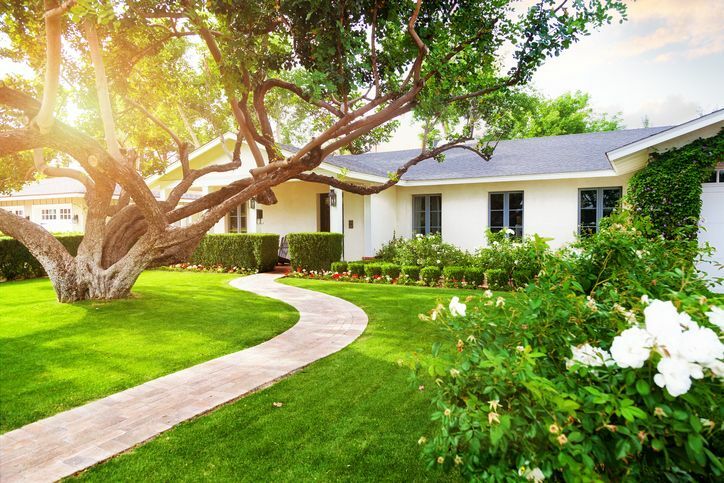 A few simple, inexpensive tricks could help put a home's yard over the top. First things first, if your home is looking shabby consider a fresh coat of paint or renting a power washer. Power washers can also come in handy for windows, walkways, and details that are looking drab. You'll be surprised by how much fresher your home can look after a vigorous cleaning. Be careful to use the right pressure settings! Don't have time to work in the gardens? Potted plants are a great, low-maintenance, and cheap way to add splashes of color and the illusion of landscaping. Do not underestimate the value of your front door. The entrance to your home needs to convey what the buyer will find inside. While a new front door is relatively expensive, Houselogic estimates a 75-100% return on investment. Clean up those leaves! This one is easy, dead leaves make a yard look unkempt. Make sure you rake or leaf blow before showing your home. Last but not least, replace that old mailbox. It's amazing how something we use almost daily can fall into disrepair without notice but this is a common complaint by home buyers. A rusty broken mailbox makes home buyers wonder what else has not been up kept in a home. Since this is a cheap, easy fix, make sure your mailbox is looking good. This entry was posted in Real Estate and tagged Curb Appeal, real estate.